The cohort of at home sewers has taken on quite a following in recent times. In fact, I was surprised at how many support groups exist for DIY sewers. Some of the groups are even specific to models of machines! 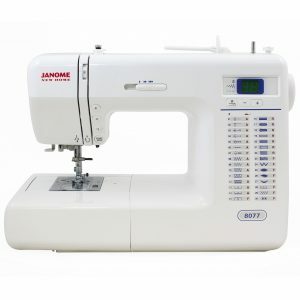 If you’re looking for the best computerized sewing machines to give you a great variety of stitches, and functions you’ve come to the right place. 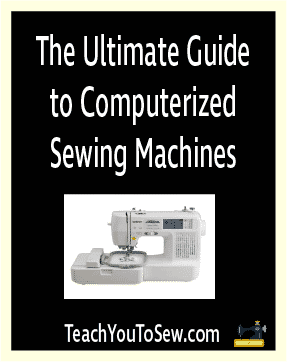 I’ve prepared a list of the 7 Best Computerized Sewing Machines to help you make a choice. As the name describes, you get 67 awesome stitches and 70 embroidery designs which come programmed into the machine. The great thing is that you can upload more designs from iBroidery.com or other sites if you need to increase your arsenal. The built-in single touch needle and bobbin thread cutter saves you having to pick up your clipper each time you finish a stitch. 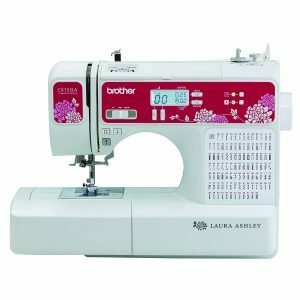 The lighted touch screen LCD display makes it possible for you to see your stitch selections and functions. Bear in mind though that if 120V AC is not available where you live, this machine is not recommended for you. Thinking you can solve that by using an adapter? If that’s your situation, all is not lost. 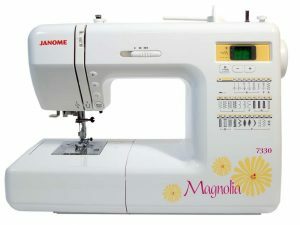 This machine comes with a total of 155 stitches, many of them decorative, to suit your sewing and quilting needs. You’ll get 11 presser feet which includes the specialty walking foot, and are stored in a drawer beneath the sewing area of the machine. The wider surface area for of the sewing table makes it ideal for when you want to take on larger sewing and quilting projects. The CX155LA can be conveniently threaded at the push of a lever beside the needle, so you don’t have to struggle to thread it yourself. The LCD display allows you to conveniently see the settings you’ve selected. 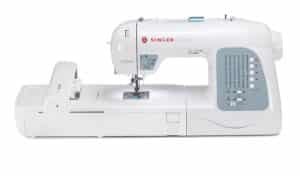 I especially love that this model comes with a start and stop button which allows you to sew without using the foot pedal. It comes with a bonus set of accessories which is two presser feet and a 5 pack of Janome size 12 universal needles. The LCD display allows you to see your machine settings and also has the ever welcome built in needle threader. I call this sewing machine the mother of all embroidery machines. It’s programmed with 125 embroidery designs and comes with a 10” x 6” embroidery hoop, with a capacity for multiple hoops. You can create your embroidery design on your computer with the software that comes with the machine then transfer it via USB cable. 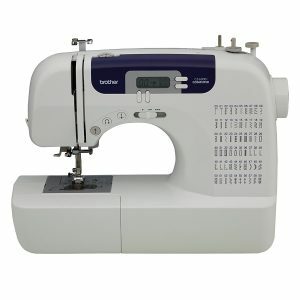 Complete with 30 sewing stitches and automatic needle threading the Futura XL-400 is very easy to set up. The one drawback I’ve found with this machine is that is that it is only recommended for use in the US and Canada which accommodate 110 Volts. Unfortunately countries not on a similar electrical system will miss out on this awesome machine. 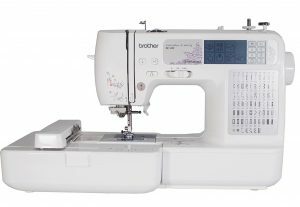 Loaded with 30 stitches, this machine can handle lightweight to heavy fabrics, although larger projects may be a bit tedious. I like the fact that it is very quiet and also has a start/stop button so you don’t have to use the foot pedal. That’s a convenient feature for people with knee problems. I am enthralled by the fact that this machine has 600 stitches! You can even edit stitches on screen by controlling the length and even create mirrored stitches without a second needle. This offers so many possibilities for creativity. This strictly table top machine offers automatic needle threading and thread cutting, with a large sewing surface for tackling big projects comfortably. What I am absolutely excited about is the fact that you get 19 accessories and tools. With the most relevant presser feet included and the hard protective cover, you’re getting an exceptional deal with the purchase of this machine. 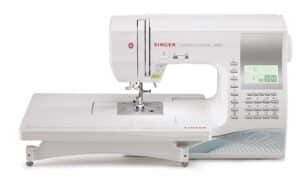 So if you’re on a budget and still looking for a versatile sewing machine, this is the one I would recommend. It comes with an easy to follow numbered diagram printed on the machine for threading, which is ideal for beginners. When you get down to the needles, it automatically threads that for you. You get a detachable over sized table to accommodate larger sewing projects comfortably. When you remove the table, it leaves the arm free for conveniently manoeuvring smaller pieces like sleeves and clothing for children. The LCD display screen allows you to keep track of your settings. You get a hard carrying case with this purchase as well as 9 presser feet. This is an excellent starter sewing machine if you want to go computerized.